Are you wondering exactly what glamping is? Put very simply it’s “glamorous camping”. In other words it’s just like camping, but in a tent which provides many of the amenities that you’d expect in a hotel room. The difference, of course, is that unlike a hotel room you will be glamping very close to Glastonbury Festival and you can walk to Gate B in just five minutes. And you will certainly have the right to feel a little smug when you see all the unwashed festival goers who aren’t living in such luxury. Everyone enjoys a spot of people watching now and again, ever more so at Pilton Festival. Were You Lucky Enough To Buy Glastonbury Festival Tickets For 2019? Now you’ve purchased your dream ticket, maybe you’re not so keen on the idea of traditional camping in a muddy field? Mud, coupled with the threat of potential theft, bad weather and unsavoury toilets sounds bad enough. Add the inconvenience of paying extra to charge your phone and queuing for hours for a hot shower and glamping becomes extremely appealing! 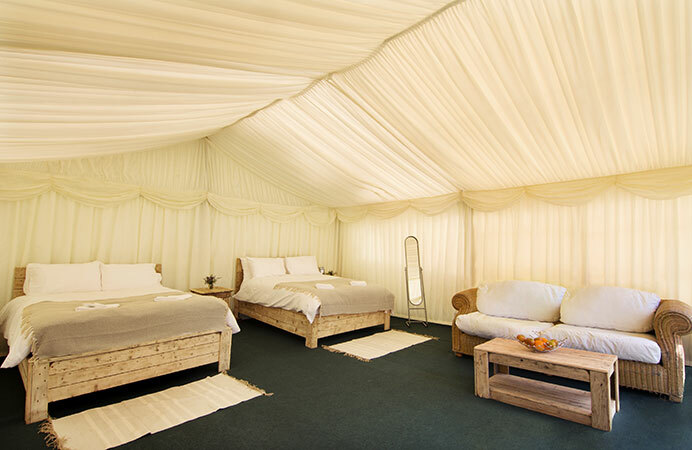 The Retreat at Glastonbury offers you an amazing luxury glamping experience that makes festival going a pure delight. What Is The Difference Between Glamping And Camping? Let’s compare the definition of the word ‘camping’ to what you can expect at The Retreat. Camping is associated with sleeping in the outdoors in a cheap tent with very few creature comforts other than a sleeping bag and a can of warm lager! The Retreat’s definition of glamping however could not be further from this. Imagine a well furnished room in a hotel or bed and breakfast guest house and you quickly understand the difference between camping and glamping. What Can You Expect Staying At The Glastonbury Retreat? Staying at The Retreat offers you the opportunity of being closer to nature and the chance to escape from the thousands of party people. You won’t have to sacrifice the conveniences and home comforts that you have come to expect from modern life. 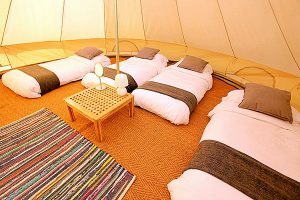 Above and beyond purely being a way to camp in comfort, glamping is a term that’s now used to describe different and stunning types of tent accommodation in The Retreat at Glastonbury. Read on to discover more about our glamping facilities or click here. A Major Upgrade From Festival Camping Facilities. At Glastonbury Festival 2019 choose to upgrade from the traditional camping experience and stay in our secure woodland retreat. We have 24/7 security and on-site amenities such as a swanky sit-down restaurant and relaxing bar offering Champagne and cocktails late into the night. Glamping provides luxurious accommodation, embracing sleeping outside in nature and the British weather. The Retreat tent structures are temporary unlike hotel rooms, but are much more rigid, strong and boast a huge range of amenities. If you have ever camped at Glastonbury Festival before, then The Retreat is a major upgrade of your past festival camping experiences. 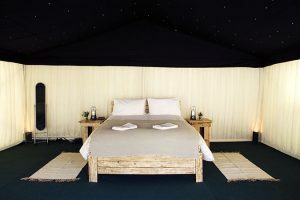 Book your 2-person luxury glamping experience from £1,899 in a Bell Tent (whilst numbers are still available) for the 5 full days Wednesday 26th June – Sunday 30th June 2019. As this is the most affordable option we offer, the Bell Tents are the first type of accommodation to sell out. All bookings must be made through our online shop. We use the Stripe Gateway which is completely secure and accepts all major debit/credit cards. Full payment on booking is required. The Retreat Glamping Safari tents are extra large, spacious tents that were originally created for lengthy stays in the African wilderness. Safari tents can have multiple rooms inside and are very resilient, tough and rigid tent structures. We also offer a variety of linings to brighten up the inside of the tents. Where possible we may be able to offer sofas as well as the solid wood beds. Electricity is standard in the Safari Tents. The reason why people choose to go glamour camping instead of normal camping is because it offers most of the home comforts that you would otherwise go without. Should you wish to treat yourself to the experience of living outdoors at Glastonbury 2019, and you don’t relish the idea of camping in a basic tent, then glamping is perfect! Additional car parking is £50 per vehicle. Prices displayed are for 2 people sharing, each additional guest is £300 for the 5 day festival. For more information call 01458 460010 or 01458 460012. We look forward to welcoming you!